GCSE French Tutor Online. Lessons with a private tutor from £11/hour. Preparation Course, Classes and Revision for AQA, EDEXCEL and WJEC. Try it FREE. You can take our GCSE French online lessons from anywhere in the UK. 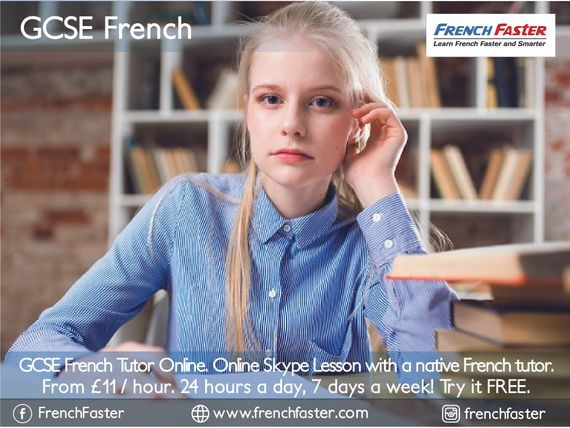 You can also take our GCSE French online classes anytime; our GCSE French tutor online is available in the morning, afternoon, evening and night - 24 hours a day, 7 days a week! Why choose GCSE French Tutor Online? Short learning period: GCSE French Tutor Online uses an accelerated learning approach that builds on your knowledge of English to help you learn French faster and smarter! Experienced bilingual tutors: GCSE French Tutor Online knows exactly what to do to help you score well in the GCSE French exam. Latest exam questions: You get model answers for recent and past GCSE French exam questions, apart from our own bank of mock questions. Excellent learning materials: You wouldn't need to buy any extra learning materials; GCSE French Tutor Online provides all pdf and audio files. Anytime, anywhere: GCSE French Tutor Online is available for classes 24 hours a day, 7 days a week! Our GCSE French program is delivered online with a private tutor. GCSE French Tutor Online is a qualified native French speaker who bilingual in French and English. GCSE French Tutor Online is very experienced preparing students for the GCSE French exam. GCSE French Tutor Online uses our Accelerated Learning method for faster progress. Our GCSE French tutor is entitled to a 5 min break after every 55 min of classes. We send you the GCSE learning materials (pdf documents) before the lesson. The GCSE French lessons are specifically designed for online learning. GCSE French is a secondary school exam suitable for students who have studied FCSE French and wish to study at a higher level. It consists of a four-unit specification. It is offered by AQA, EDEXCEL and WJEC examination boards.